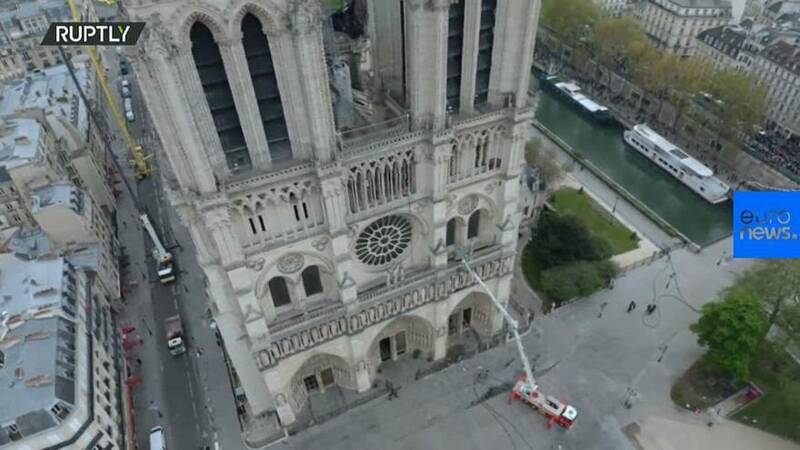 Drone footage has revealed the shocking extent of the damage to Notre Dame cathedral in Paris, which was hit by a fire on Monday night. More than €700 million has been pledged by donors towards rebuilding the world-famous landmark, and French president Emmanuel Macron told the nation the work must be completed within five years. But rebuilding the cathedral will be a monumental task. Drone footage shows for the first time the aerial view of damage to the roof. The cathedral's spire was completely destroyed after it collapsed in the blaze, and it was only due to the work of firefighters that there wasn't greater damage sustained. Laurent Nunez, France's deputy interior minister said the inferno was 30 minutes away from destroying the entire building. He praised firefighters who he said "risked their own lives" to salvage the 850-year-old landmark's structure and two belfries. Emergency services are now carrying out a security and safety assessment of the building. A Paris fire official said the towers of Notre Dame Cathedral would have fallen if firefighters hadn't deployed massive equipment and acted swiftly to fight the fire racing across the monument. A Paris official also added that the fight to save Notre Dame's towers was the fight that saved the entire cathedral as their collapse would have caused a "domino effect". Investigators said they were "favouring the theory of an accident" being the cause of the fire, with a probe into what happened ongoing.